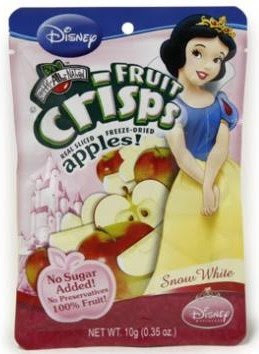 Remember Snow White? Remember the Evil Queen that wanted to kill her? Remember how that Evil Queen poisoned her with an apple? Note that the box for the dried fruit snacks says, "No Sugar Added! No Preservatives, 100% Fruit!" That's great, but they don't mention anything about poison. Who wants a box? Thanks to Michi for bringing this ridiculousness to my attention. I want to see Ariel's Little Mermaid fish sticks and Pumba's pork rinds. I think my inner graphic designer just took on a new project. This is a good reminder for all marketers, designers, and the entire marketing team. Well, mistakes do happen but it can be prevented.